Fabrice very impressive what you have and learned and acheived since i left for Tenerife 11 weeks ago. 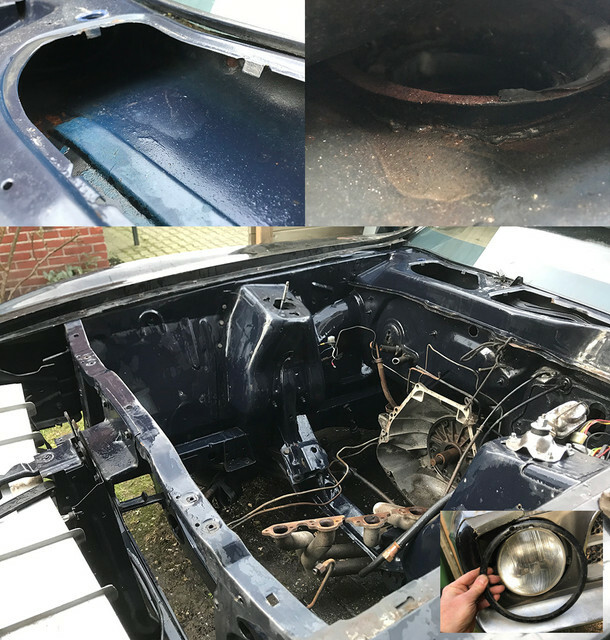 I have to sort my hood hinges at some point in the future so will be interesting to see your results. thx @Pegleg, you might get 1/2 an answer below.. Still cold and wet: back to MUSTANG SCIENCE! Short story: Glasses, gloves on, back to drawingboard! Unlike with expensive solutions, I needed 2 liters of vinegar to start over. The only problem being the time necessary to obtain a saturated enough electrolysis. at least 24 hours. Got just enough ready on time for my next victims! 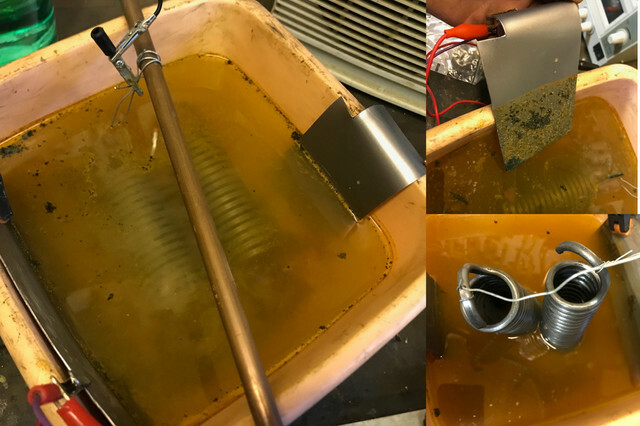 Meanwhile, during past week, I've seen that what looks clean to the eye, isn't perse true from a plating perspective, and that's exactly how I've ruined my bath last week, by dropping all kind of test bolts not really clean and having all kinds of metals on them that acted as contaminants. 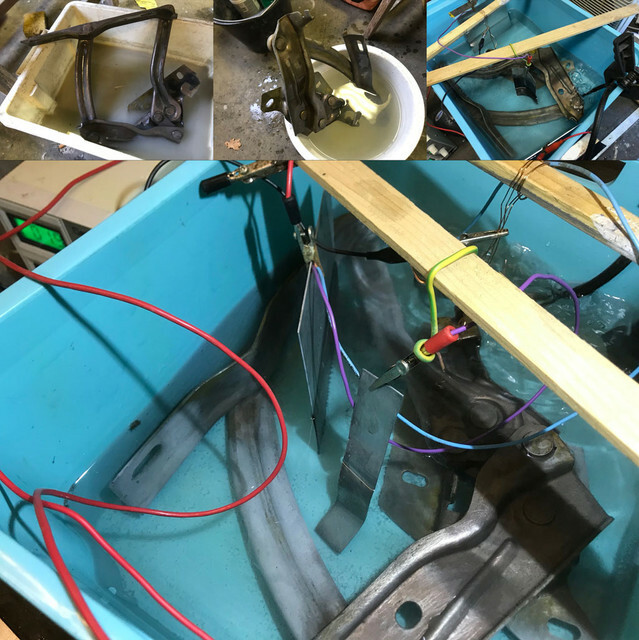 So as the hood hinges springs were next on the todo, they were previously de-rusted, but spent another 24 hours under current to remove any impurities before be placed into the bath. The solution for this is washing soda in warm water (that went cold over time as the bath heater hasn't arrived yet ). 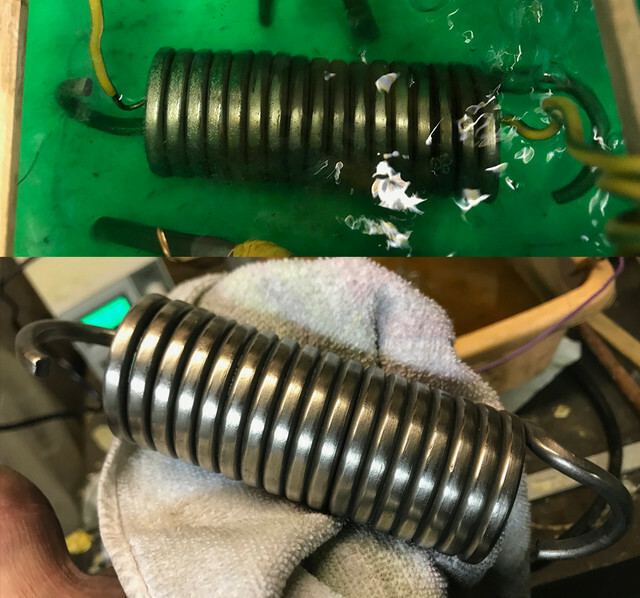 The springs came out really pristine after this electro cleaning, especially where you can't really go with your hands or tools. 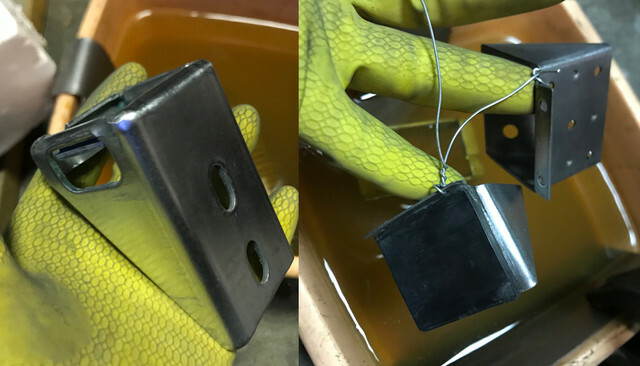 While the springs were in bath, I've finished the lights, because the gasket and the plastic lens aren't really following the shape of the casing, I've taped, primed and painted the region that was exposed. Few moment later, helped with heat gun in between they were both finally done. Prolly a tad overkill. But I was finally able to mark the valance lights as done! Yeah! This week some of the heavy guns that I've ordered arrived! I got myself a super ultra whatever air pump for aquarium, (5 buxx) and finally got my hand on non coated pure copper wires. One would think you find this wire everywhere... nope. In all kinds of flavours, all plated/protected but not the raw copper I was after. Anyway no more hand stir, no more house wire stripping! Bubbles machine in place, the first spring was set in bath after distilled water rinse, a 10 minutes hydrochloric acid session, followed by another water rinse. Not perse visible on the pict, the bath gets a nice displacement/circulation, but not enough to blow the parts away. Funny here is that some people actually buy this cheap pump for their aquarium at home. This thing makes more noise than an old fridge! 3 hours later the first one was done. very hard to photograph the diff into the bad light of my garage, and the next spring was just rinsed, but you can see the difference. Probably because of the shape, acting as a coil, it demanded lots of attention and did not behave as any of the parts tried before. 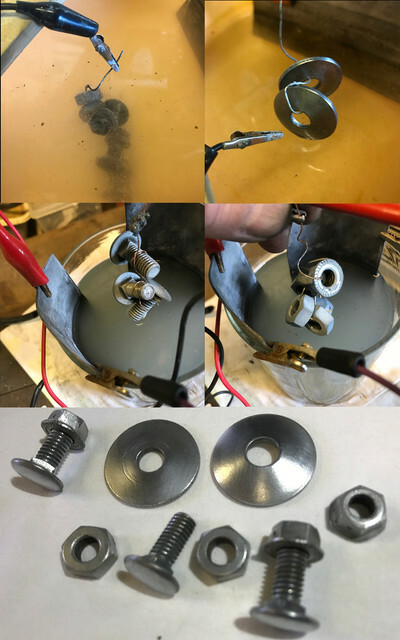 I needed to move, rotate the part, change position of the anodes constantly to get a nice even layer of nickel. Here's a close up of both the super clean not plated and the plated one. @Don C, very hard to plate inside indeed, if you try the electroless kit, I'd be very curious to see how that turns out when you do yours. Another 3.5 hours later, the second spring came out. Notice on the above pict the diffs in regions of the plating while busy. Found out that a given moment, probably once the entire surface was covered that the amps were fluctuating and going down, at this point the metal being platted becomes almost like chrome and gets deposited on the surface much much faster. So just like the first one, during last few moments, I was rotating the part every minute and it payed off nicely. This is how it came right out the rinse bath. Once air dried and gently polished with kitchen paper, it's the most beautiful spring ever seen in my street ever! Really pleased with the results as I did not expect to get them as nice as they turned out. For the rest of the hinges, I'm still experimenting juices as I'd love something darker and less reflective. I hope to find out something nice for next weekend..
Too cold for me to stay longer, I've set the next soup on and should be done by tomorow. 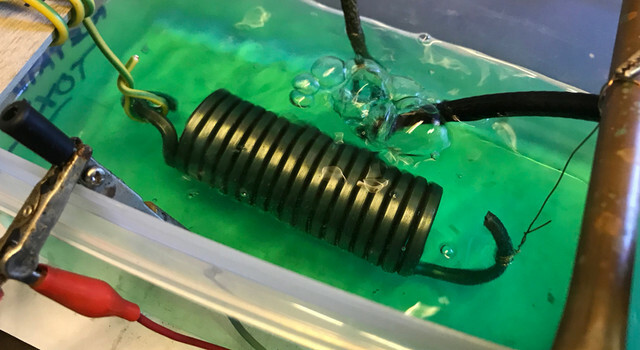 Because using the electroplating method doesn't seem to get into cracks and crevises I'm guessing the plating didn't bond the spring coils together. That is my main concern with using the electroless method, which is supposed to get into irregular surfaces. 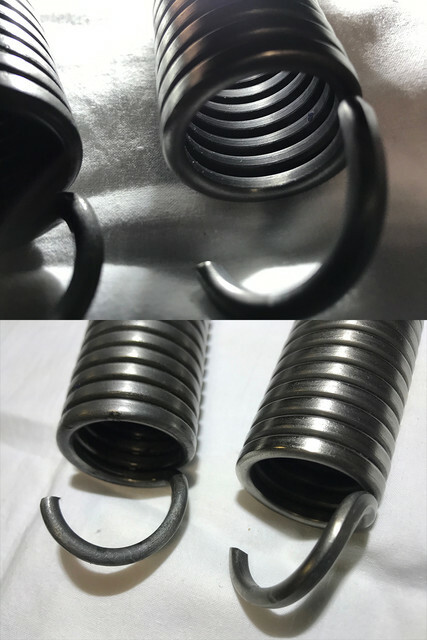 (02-03-2019, 06:48 PM)Don C Wrote: Because using the electroplating method doesn't seem to get into cracks and crevises I'm guessing the plating didn't bond the spring coils together. That is my main concern with using the electroless method, which is supposed to get into irregular surfaces. Well, first, my plan was to make an external tensioner, just to have more space between coils. 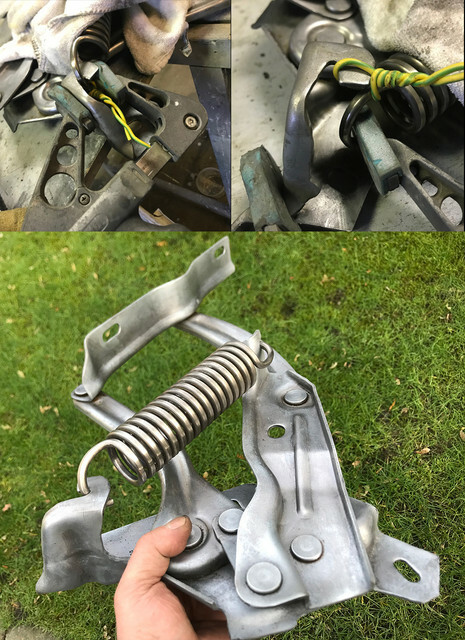 tried via the inside, but because the end of the spring is rotated 90 with an offset, you can't insert any rod thru the spring with the necessary offset to do this. The good news is that the coils are really round, so they touch each other with a very small surface, also being at rest, once you lift on one side, the coil becomes tensioned a bit by its own (heavy) weight, it's no longer in a straight line (And you as you need to rotate a lot while busy). It's very small, but there is a space. 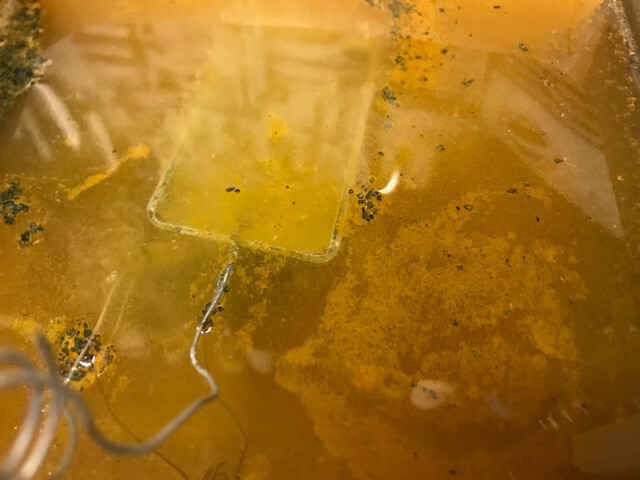 The electrolyse just need to be in contact with the surface to do its work. Even if that is a micron, thats enough. The problem is not if there is a deposit in between, the problem is its thickness and looks. 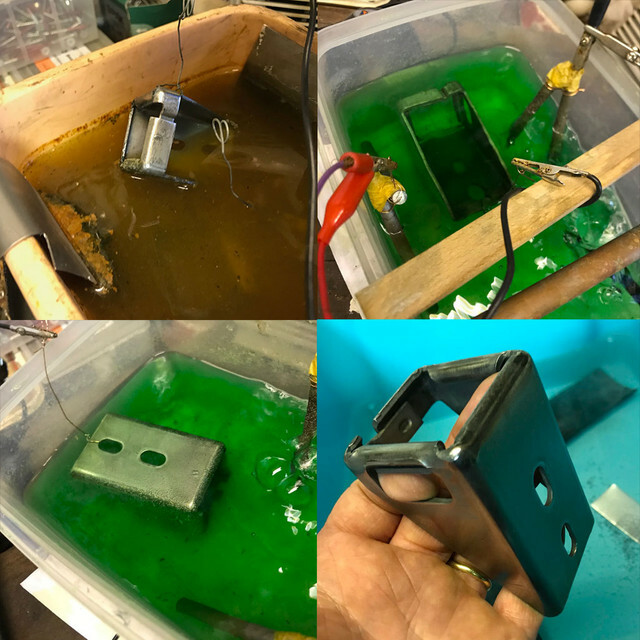 Just like any parts done so far, if there is no polishing of the surface, it's not shiny, and if concave or encapsulated, you get less on the surface. That's partly why i've let them more than 3 hours each so that the entire surface got covered. Even if that would be only a few microns. 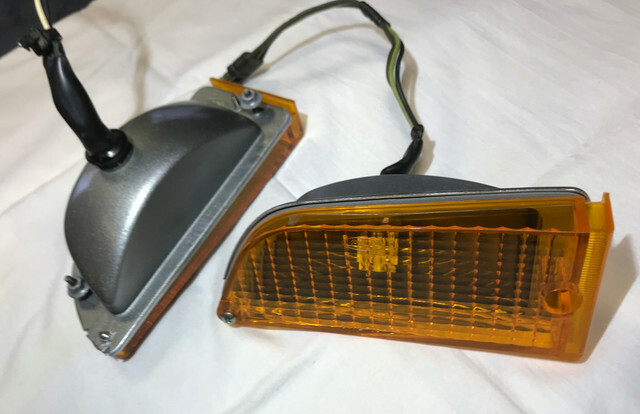 I can see in the inside clearly the nickel yellowish deposit everywhere, really different than the grey it was having right after the electro cleaning. Also i've found out that using this mild acid method, that building up the current gives the best results. Like less than a volt for the first 10 minutes, then gradually up to 2.5 volts. Last minutes around 3, 3.5 with 1 amp. This creates also a much more visible difference from the inside/concave vs outer surfaces where you get a near chrome surface look (if surface wasn't sandblasted). If the electroless method is not too thick and can be done very slowly, from what I see you should be able to plate without bonding. In worse scenario, you would need to make the tensioner that i've skipped. When they are at rest, you really do not need that much to be able to have enough space in between, say a paper sheet thickness. thx @Pegleg, not sure if there would be much demands. I'm sure the girl at the supermarket must have wondered what on earth one could possibly do with so much vinegar! While the juice for zinc was cooking, went back to the deck lid lock of the 73. Turned out just like the 71: bling bling! Meanwhile, couldn't resist and had to test the zinc and the plate+screws inside the driver's mirror were good victims to try that out. Unlike Nickel, unless you used complex and very nasty additives that affect the way crystals are forming, you end up with a mat deposit. Zinc being a cathodic soft metal, it takes 1/2 a drup of elbow oil to make it shine. The price to pay for using environement friendly soup. Same punition for the windshield stops. They will be painted later on, but as I know from the 73 that they do oxide, these will not for a long while. One of the rubber is missing, I have already the necessary in house, but was short on hands and time to get to it. Will do this this week. 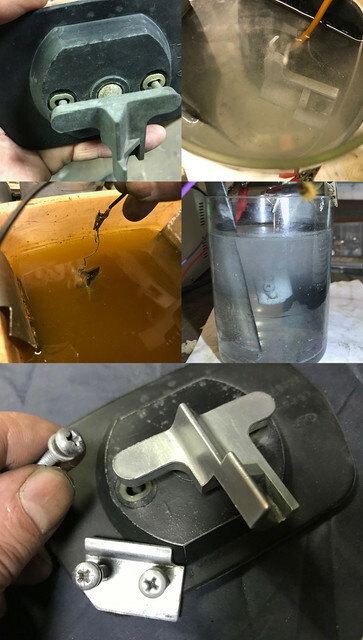 While the air pump in bath was buzzing, been busy prep the passenger side mirror. Like a deja vu, been thru the joys of paint stripping and got the casing in zamac ready to wait for a paint job. protected for another 1/2 century, I'm gonna paint the back side soon, and will try to see if i can locate some mirror glass while at it. And then it was time to work on the first hinge. Both got paint removed and were derusted a few weeks back, so a degrease and rinse session were done and the first one went into the solution. Once rinsed, dried and the dull removed. It's when I compared with the other one that the difference was really visible. Much whiter. As seen with nickel, its sometimes hard to notice the color change of the substrate while busy but it was covered everywhere. In contact with moisture, the dull would return. As I do refuse to use the lethal chromates to passivate, grand pa's wax and oil will take care of that. The metal underneath is now protected and rust should not return for a long while, which is the primary goal. Took much more time than expected, the other one should go faster now that the solution is bits saturated. I'll see how that goes next weekend. They should look pretty with their nickel springs once on the dark green hood. The springs are back! 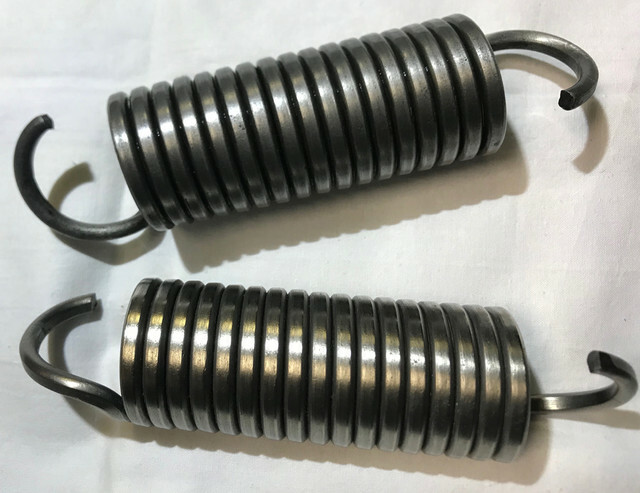 Both my springs and the spring! The sun was back for the first time since new year and working outside was really plaisant for a change. 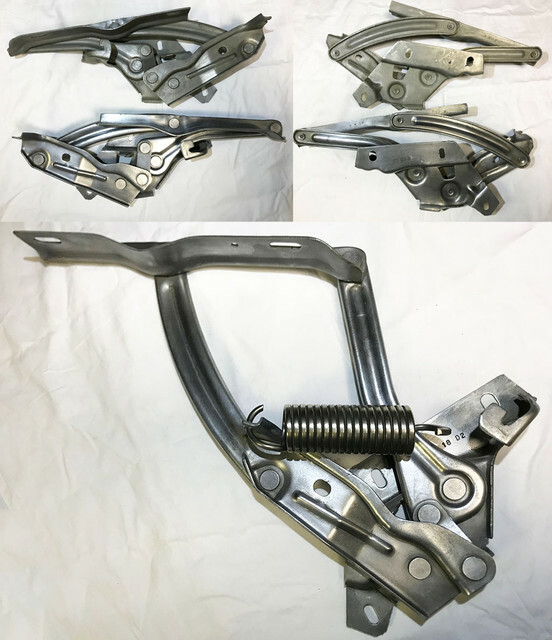 Finished zinc plating the other hinge and enjoyed the royal pita that is to place the springs back in place while the hinges are not held by something. Not wanting to damage the nickel, had to build up tension with some wire, weird constructs to hold... royal pita and was not done in 5 minutes. Glad both are finally done. and replace them. Not because there are damaged, but it would have been so much more easy and would have got a better result with smaller parts vs a huge assembly that was pain to move around, sucking power etc... Looking back at how they were in the first place, no regrets at all, but would have been better. Because it was such nice weather, I went back on the car to collect "todo" parts and while at it, cleaned the engine bay to inspect it more closely. I'm was fairly surprised to see that what I took on many places for light rust, was not even rust but dirt. 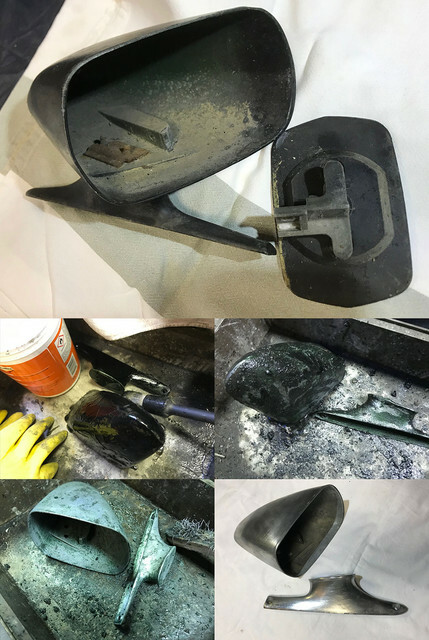 Even the cowl vent is painted inside, and has just a start of rust that needs be handled. Not claiming the car will be on the road by next week, but the extend of the todo is less than expected. In between things, I've let some hardware cook over night, brushed and electro soda to clean up last details before apply a layer of sinc. As I can't buy this kind of hardware in any local store, I'm really amazed once more at what 2 or 3 volts and a tad of vinegar can do. Zinc is also much more easy than nickel, it needs much more power to get started on this kind of aloy, but once a few microns are succesfull, it build up super fast. One of the todo very soon is to get that C6 out to rebuild it. But that header in the way must go out first. It's really stuck and considering to cut it for a new pair that would not arrive here under 1200, I would very much like to succeed to separate the 2 tubes. I'll let them coated once done. I'm gonna get a torch this week and they've received plenty penetrating oil. There is some hope, but if any one has a good trick to get this done, please shoot! Done details too. I've inserted a piece of thermo rubber on the winshield blocks that were plated last week, so I will be able to paint them very soon. Very nice, Fabrice. You've certainly accomplished a lot in the last few weekends, especially considering the weather. Wow, man, that is a lot of great work. Keep it going! You have to be very proud of yourself being able to accomplish all that on your own.